An atom is the smallest building block of everything that exists. The smallest object you can see under a microscope has more than 10 billion atoms . 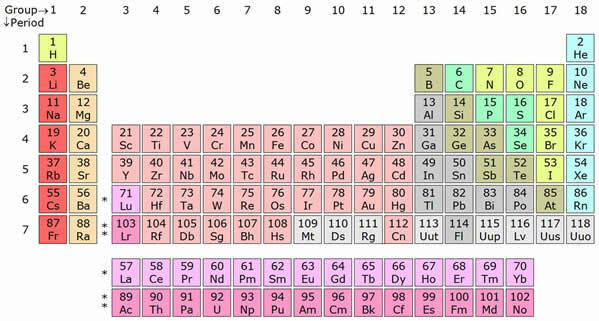 There are over a hundred different types of atoms, that we call elements. They form the world we live in. Well known elements are hydrogen, oxygen, iron or lead. When two elements get together they form a compound. For example, water has two atoms of hydrogen and one atom of oxygen. Atoms all have about the same size, but they have different weights. Plutonium is one of the heaviest atoms , about 200 times heavier than hydrogen , which is the lightest element. An atom consists of three parts : protons, neutrons, electrons. Protons and neutrons are in the centre of an atom, which is called the nucleus. It is very small if you compare it with the whole atom and it has almost all of an atom’s mass. If an atom had a diameter of about 6 km the nucleus would only be as big as a tennis ball. The rest of the atom outside the nucleus is mostly empty. Electrons fly around in an atom very, very quickly. They have almost no mass and travel around the nucleus millions of times every second. The parts of an atom have electrical charges. Each proton carries a positive electrical charge and each electron has a negative electrical charge. Neutrons have no charge. In most cases an atom has the same number of protons and electrons. It is electrically neutral. The energy of the nucleus keeps the electron inside the atom—just like the Earth keeps the moon in its orbit. But electrons have energy themselves. They want to break away from the nucleus. If an electron has a lot of energy it moves around farther away from the nucleus. Electrons move around the nucleus in up to seven round paths , called shells. The first shell is closest to the nucleus. It can hold two electrons. The second shell can hold 8, the third 18 and the fourth 32 electrons. In most atoms, the outer shells are never completely filled with electrons. The inner electrons travel fastest, the outer ones are the slowest. The atomic number tells you how many protons an atom has. For example, every hydrogen atom has the atomic number 1 because it only has 1 proton. Elements that have atomic numbers of up to 92 can be found in nature; those over 92 are created by scientists in a laboratory. The atomic number tells us where we can find an element in the periodic table. This table shows all the atoms in groups. The atomic mass is the number of portions and neutrons in an atom. Although all atoms of the same element have the same number of protons, they sometimes have more neutrons. Such atoms are called isotopes. For example, hydrogen has three isotopes. Most of the time a hydrogen atom has one proton and one neutron. Sometimes you can find hydrogen isotopes that have two or three neutrons, but they too have only one proton. In most lighter elements the nucleus of each atom has the same number of protons and neutrons. but heavier elements have more neutrons than protons. Uranium , for example has 92 protons and 146 neutrons. It’s atomic mass is 238. The atomic mass is never a whole number, because scientists do not just add protons and neutrons together. They use a complicated formula. Normally, an atom is electrically neutral. But it can gain or lose electrons when it crashes with other atoms. Atoms that gain or lose electrons are called ions. They have an electric charge. Atoms that lose electrons become positive ions; atoms that win electrons become negative ions. In some atoms the nucleus can change naturally. Such an atom is radioactive. When a nucleus changes it produces rays. In nature, there are some elements that are radioactive, like uranium or radium. In labs scientists can produce radioactivity by bombarding atoms with smaller particles. In the 1930s and 40s scientists found out that if they bombarded a uranium atom with a neutron the nucleus would split up into two parts. When this happens energy is set free. We call this nuclear fission. Fission was first used in atomic bombs that the Americans dropped over Japan to end the Second World War. The bombs released so much energy that they killed hundreds of thousands of people. Later on scientists found out how this energy could be used in a peaceful way. In the 1950s the first atomic reactors were built. They produced energy by splitting atoms. Compounds are groups of two or more elements that are tied together. They are created when two different atoms share the same electron or when electrons travel from one atom to another. Every compound has certain features and a chemical formula. Water, for example, is a compound that has two hydrogen atoms and one oxygen atom in it . Its chemical formula is H 2O. When sodium (Na) combines with chlorine (Cl) you get a compound called salt (NaCl). Carbon and hydrogen atoms form methane, or natural gas (CH 4). Compounds can be divided into two groups: organic compounds always have carbon atoms in them. You can find them in all living creatures, in plants and in a lot of our food, for example sugar and fat. All other compounds are called inorganic compounds. Compounds can be solids, liquids or gases. They may also turn into many different colours. Some compounds react very quickly, others don’t react at all. The hydrogen atom is the smallest that we know and it has a very simple structure: one proton with a positive charge and one electron with a negative charge. Hydrogen is one of the most common elements in our universe. The sun and many stars are made of hydrogen. It can also be found in the earth’s crust. Hydrogen is in many compounds of animals and plants. Hydrocarbons are compounds that only have hydrogen and carbon in them, like petroleum, natural gas or plastic. Hydrogen has many uses. When two hydrogen atoms get together they form a molecule and give off a lot of heat. That’s why, together with oxygen, hydrogen makes a good fuel. It, for example, powers the engines of space rockets. Power plants use hydrogen to produce energy. There are even cars that run on hydrogen fuel. When you add hydrogen to coal you can make petrol. Helium is a light, colourless gas that you can’t smell. It belongs to the group of noble gases because you cannot combine it with other elements. It has two protons and two neutrons. Like hydrogen, we can find helium everywhere in our universe. On Earth, helium can be found in natural gas and in the atmosphere. It is so light that it rises and escapes into the atmosphere. Helium is used to fill balloons. They can rise very high because helium is lighter than air. It is also safer than hydrogen because it does not burn. People who suffer from asthma sometime inhale helium and oxygen because helium can enter the lungs more easily. Nitrogen is a colourless gas that you can’t smell. It makes up about 78 % of the Earth’s atmosphere. Nitrogen’s chemical symbol is N. Its atomic number is 7 and its mass is 14. Nitrogen gas has two atoms bonded together to form a molecule. The gas can be made into a liquid that freezes at -209° and boils at 195 ° C.
Nitrogen is also used as a fertilizer, which plants need to grow. Iron is a silvery, white metal that you can find in rocks. Its chemical symbol is Fe, for ferrum. It has 26 protons and a mass of 56. The industry gets pure iron out of ore that is melted at a high temperature about 1,500 ° C.
Carbon is one of the most important elements. All living creatures have carbon in them and the industry uses carbon in many ways. Carbon’s chemical symbol is C. Its atomic number is 6 and it has a mass of 12, but there are other isotopes of carbon too. Carbon atoms like to form bonds with other atoms. They can link together with other elements and form very long chains. A lot of carbon on Earth is found together with other elements. Carbon dioxideis in the air that we breathe out. Minerals, like limestone have carbon in them. Mixtures of carbon and hydrogen are in petroleum and natural gas. Pure carbon does not occur very often on Earth. The best known forms of pure carbon are diamonds and graphite. 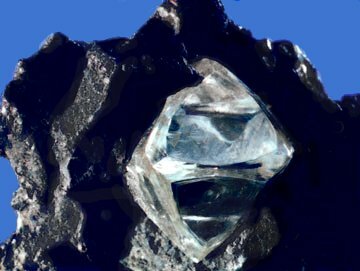 Diamonds are the hardest objects on Earth. They are in the Earth’s crust, formed under high temperatures and pressure. Diamonds are very valuable. Most of them are used in industry—to cut or polish other objects or as drilling heads in oil fields. Graphite is a soft grey or black mineral. Like diamonds, graphite is formed under the surface of the Earth. It is used in pencils and, because it is lightweight, you can find it in spaceships, tennis rackets and bicycles. Chlorine is a poisonous greenish-yellow gas with a strong, bad smell. In nature, it can only be found together with other elements, especially in minerals. Together with sodium it forms salt (NaCl). Chlorine is used to make water clearer and purer. In swimming pools it kills bacteria. We also use chlorine to clean metal. The industry uses chlorine compounds to produce paper, plastic, medicine and paint. Chlorine often combines with other elements because it easily accepts free electrons from them. It has 17 protons and an atomic mass of 35. Aluminium is a very light silver metal that can be formed into any shape. It is one of the most common elements on Earth. About 8% of the Earth’s crust is made up of aluminium. But you always find it in combination with other elements, never in its pure form. Aluminium is often used as an alloy—together with copper, magnesium or tin. When it is formed with these elements, aluminium becomes very valuable. Such alloys are very light, but strong. They do not corrode and electricity and heat can pass through them easily. Aluminium can be as strong as steel. It is very often used to make cars and trucks as well as containers for ships. Industries make cans, pots and pans out of aluminium. Most of our aluminium is found in rocks called bauxite. About 500 kg of aluminium can be made out of a ton of bauxite. This valuable raw material is mined in tropical and subtropical countries. Australia, Jamaica, Brazil are among the biggest producers. Gold is a shiny, yellow metal , probably one of the most expensive on Earth. It was one of the first metals discovered and people have been using gold for jewellery and coins for thousands of years. Gold’s chemical symbol is Au (Latin for “aurum”) .It is a soft metal that can be pressed into many different shapes. One ounce of gold (about 30 grams) can be made into a thin wire that is 70 km long. Gold does not rust when it gets into contact with water or air. Radios and TV sets have parts made of gold because electricity can pass through it well. Dentists use gold to make crowns, because it is easy to shape and gold crowns last a long time. Artists use thin sheets of gold to decorate objects. Gold can be found in many rocks on Earth. In most cases , gold ore is mined deep under the surface. Sometimes gold is washed away by rain and wind. It gets into rivers where it sinks to the bottom because it is very heavy. In the middle of the 19th century a gold rush broke out all over the world. Gold was discovered in the rivers of Alaska, California and Australia. 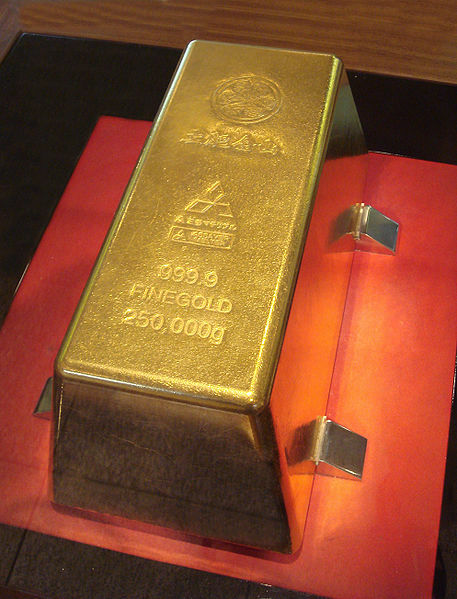 Today, South Africa, the USA and Australia are the world’s largest gold-producing countries. Have scientists discovered the Higgs boson? lead = a soft grey metal that melts very easily. It can be found in pencils.